Aimed at martial arts athletes, coaches and instructors, this guide addresses important self-care issues for the martial arts. 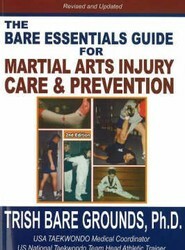 It covers: Stretching; Conditioning; Nutrition; Instructions; Self-care; and Instructors and Coaches. It also includes tips on coping with: Blisters; Ankle Injuries; Back Pain; Knee Injuries; Groin Pulls; Asthma; and more.